Studies have found Zoloft effective in the treatment of major depression, OCD, panic disorder, social anxiety disorder, PMDD and PTSD. Sertraline works by blocking the uptake of serotonin into human platelets (In short, it’s an SSRI). It is widely prescribed because it has fewer and less severe side effects and interactions than many other drugs. It is also not particularly prone to abuse since it takes about a week to achieve steady-state plasma levels. Effectiveness of Zoloft has been measured via the Liebowitz Social Anxiety Scale (LSAS), the Clinical Global Impression of Improvement (CGI-I), the Duke Brief Social Phobia Scale (DBSPS), and the Marks Fear Questionnaire Social Phobia Subscale (FQ-SPS), inter alia (See fn. 1). If you have liver problems, Zoloft could be dangerous since it would likely take the drug longer to leave your body and could therefore build up to unsafe levels. Studies have shown that children metabolize sertraline more effectively than adults, so they would likely need smaller or less frequent doses (since their bodies absorb more of each dose than an adult’s). Zoloft should not be taken by people who are on MAOIs or pimozide. Zoloft’s liquid version should not be taken by people who are on disulfiram (Ibid). Possible side effects, according to Pfizer, include mania/hypomania, weight loss, weak uricosuric effect (you might get kidney stones), hyponatremia (low blood sodium levels–a concern for me, since I run for hours at a time in the Florida heat), abnormal bleeding or purpura (Pfizer seems to dispute this one). Studies have shown decreased fertility and increased infant mortality in mice, rats and rabbits when they were administered high doses of sertraline when attempting to become pregnant or while pregnant. Sexual dysfunction and priapism are a possible side effect of any SSRI (Ibid). 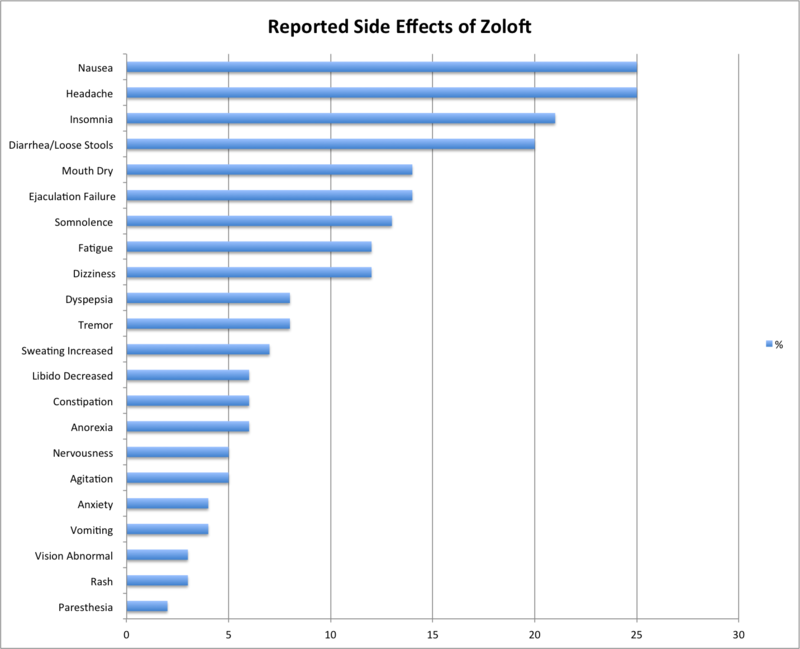 Premarketing studies of Zoloft categorized the following side effects as “frequent”: impotence, palpitations, chest pain, hypertonia (tense muscles), hypesthesia (numbness), increased appetite, back pain, asthenia, malaise, weight increase, myalgia (muscle soreness), yawning, other male sexual dysfunction, other female sexual dysfunction, rhinitis, tinnitus, micturition frequency, polyuria, urinary retention, dysuria, nocturia, and urinary incontinence. Pfizer refers to this kind of stuff as “adverse events temporally associated with Zoloft”, because the reality is this is just a laundry list of every single negative experience anyone taking Zoloft during a given study experienced during that time regardless of causality (Ibid). In addition to the possible side effects of taking Zoloft, if one were to discontinue Zoloft there would of course be additional potential side effects. 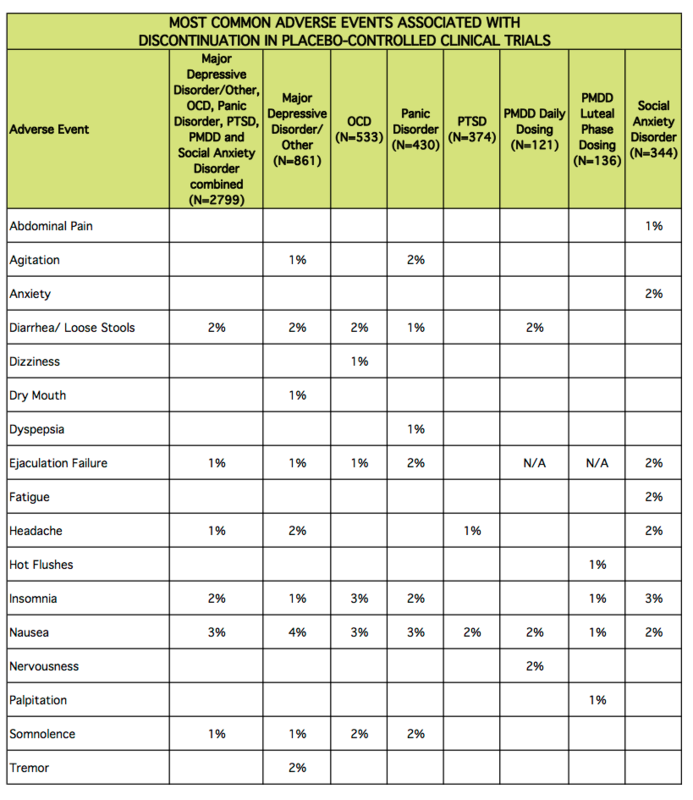 The below table shows the statistically significant ones as reported by Pfizer. So, does Zoloft cause weight gain? Most of the above relies on a document (re fn. 1) that Pfizer and the FDA agreed upon. Now, I don’t particularly trust either organization, but they do have quite a bit of research on their side. So, according to their own findings, does Zoloft cause weight gain? No. In fact, it may even cause weight loss. That said, according to Pfizer’s premarketing research, weight gain is frequently “temporally associated with Zoloft,” for what it’s worth. MentalHealthDaily.com speculates that a combination of “increased carbohydrate cravings, metabolic adjustments, as well as standard medication side effects such as lethargy” lead to weight gain for people taking Zoloft. MHD’s piece on the subject seems largely anecdotal though. The Mayo Clinic has an article on antidepressant-induced weight gain: It pretty much dismisses it by pointing out that depressed and anxious people often have unhealthy eating patterns. The 2003 paper quoted above also provides suggestions, listing topiramate and sibutramine as possible adjunctive medications to moderate weight change in SSRI users. The researcher also suggests improving one’s diet, increasing exercise and/or switching medications. He concludes by noting that there is a stronger positive correlation between “improvement in depressive symptoms [and] weight loss” than between any one treatment regimen and weight gain. In other words, your weight gain is more likely a psychosomatic symptom than a pharmacological one (See fn. 3). Based on all of the above, it looks to me like the most likely catalyst for unwanted weight change in SSRI users is psychological and the best treatment is a more dialed-in diet and exercise regimen. My doctor came to the same conclusion, telling me that the amount of Zoloft I am on is a “baby dosage” and very unlikely to cause any significant symptoms. So, if you’ve gained weight on an SSRI, it’s probably because you’re either eating more or exerting yourself less or both. In my case, it’s the former. The evidence for a causal link between SSRI treatment and unwanted weight change is limited and largely anecdotal. A couple of the papers I read, especially the 2003 one (fn. 3), note that the amount of annual weight gain reported by many SSRI users is about the same as the amount of weight the average American puts on every year of their adult life ( ≈ 3 lb / 1.35 kg). I admit I was hoping to find a causal relationship between Zoloft consumption and weight gain. I was also hoping to learn of a magic pill to reverse this effect. Since neither of those panned out, I’m going to try eating more fruits, vegetables, nuts and beans and fewer simple carbs and meats. Hopefully that will make a big enough difference that I will return to a BMI with which I am comfortable. Wish me luck. And good luck to you.